The Fellowship events in 2019 have begun with an excellent study weekend 1-3 February hosted by the welcoming Parish of St Demetrios in Edmonton, North London. [The photographs in this post are all from that event and we appreciate the parish allowing us to use them.] The study weekend was on the theme of “Truth, Love and Fellowship in the Epistles of Saint John“. We heard from Metropolitan Kallistos of Diokleia, who introduced the epistles to us. The main themes were taken up by different speakers: Dr Krastu Banev focussed on Fellowship; Fr Chrysostomos Tympas spoke about Truth; and Fr Kristian Akselberg spoke on Love. But our discussions were far wider and included baptism, the influence of the saints in our lives, prayer for others, how we should treat other Christians and non-Christians, art, how to love, and a whole host of other issues. It was a great start to our year! We thank Fr John Hookway and all the Parish for generously hosting the weekend. And this was only the start! The Youth branch will be having their annual festival 24-27 May for 18-35 year olds on “Discovering Orthodoxy through our Saints“, held at the Othona community in Bradwell-on-Sea, Essex. In September, we hope to have a meal in Oxford close to the feast of the Conception of St John the Baptist, at which all will be welcome. More details to come! Don’t forget, the Women’s Ministries Initiative hold their own events such as study days, and the Mosaic Choir will be performing in various places at various times. If you know of other events that we should include on our calendar, please let us know. John Speak (1944-2018) – Memory Eternal! John was formerly Chairman of the Orthodox Fellowship of St John the Baptist. He was born in Wakefield and was a scientist, graduating at Oxford in Physics in 1966. He retired in 2004 after 27 years’ service at Stamford School in Lincolnshire. Colleagues have spoken warmly of John and his work, one saying it was a privilege to work with such an expert physicist. John began his long association with 2, Canterbury Road at Oxford, living there when Donald Allchin married him to Marilyn in 1966 and the wedding reception was held in the garden. John and Marilyn had 3 children and 9 grandchildren, to whom he was devoted. John encountered Nicholas Zernov and the Orthodox Church at Oxford, but it was not until 1988, when he felt able to travel for services, that he was received into the Church by Father Barnabas of New Mills, Wales. John cared deeply for the Orthodox Fellowship of St John the Baptist. As chairman (2007-2013), he was extremely conscientious, an examiner of detail, who always acted with the utmost integrity. He was warmly appreciative of others, praising the time and expertise that so many members gave to the Fellowship. John spent many hours on the important revision of the Fellowship constitution approved in 2013, that included the important provision that a President should be appointed in the Fellowship from among the Bishops of the Pan-Orthodox Assembly. John supported all Fellowship activities including the Youth Festivals. He was delighted to see young members coming in to take over his work. John was a member of the Rutland and Peterborough Theological Societies and a valued supporter of the Institute for Orthodox Christian Studies in Cambridge – in all three bodies, he was well known for asking penetrating theological questions. John appeared to be recovering slowly from a stroke, but he was too weak for the medical team to operate on a leaking heart valve and infection. He knew he was dying, but was peaceful after Father Raphael Armour, priest from the parish of St Ephraim the Syrian in Cambridge, came and ministered to him. John in his weak physical condition, listened to recorded liturgies, making the sign of the cross, so was full of faith and in communion with the Church he loved at the end of his earthly pilgrimage. John reposed on 21 August 2018. May his memory be eternal! Margaret Thatcher became the first female Prime Minister. It was also the year that the Fellowship of Saint John the Baptist was founded to bring together English speaking Orthodox in the UK. Next year, 2019, the Fellowship Celebrates Forty Years! As well as holding a fun, fortieth, family festival in the Summer- we’d also like to produce a special 40 years anniversary edition of Forerunner. So if you have photos, memories or anecdotes of the Fellowship in the last 40, 30 or even 10 years, please share them with us! Also, for those of us who weren’t even born 40 years ago – what is your vision for the next 40 years? 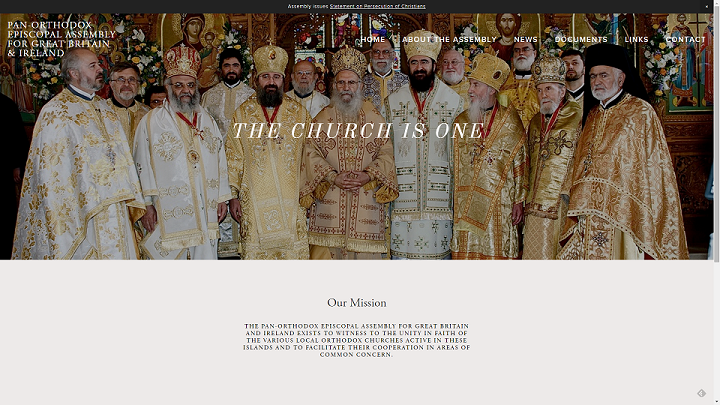 The Pan-Orthodox Episcopal Assembly of Great Britain and Ireland have a new website. The Episcopal Assembly is one of thirteen bishops’ assemblies that have been established in different geographical regions throughout the world. It is made up of all the active, canonical Orthodox bishops with churches in Britain and Ireland. Some of their most important documents and statements can be found here. These include a recent Statement on the Persecution of Christians and Pastoral Recommendations On Preparation for and Receiving of Holy Communion. The Assembly was established in accordance with the Decision of the 4th Pre-Conciliar Pan-Orthodox Conference, held in Chambésy, Switzerland in 2009, at which representatives from all the universally-recognized autocephalous Orthodox churches met and considered the situation of the Orthodox communities in the Diaspora, that is, in countries outside the canonical territories of the established Local Orthodox Churches. The Assemblies are designed to promote cooperation among the Churches and to prepare the way for the resolution of the canonical anomalies associated with overlapping jurisdictions.